Greetings earthlings and headbangers that have graced this wonderful planet, I’m OverlyMetalJames here I bleed you one of the finest metal releases of 2015 that will tear flesh from your face!! It’s been a while since I did any reviews due to the crimbo season etc, but I am back and armed with a masterpiece of excellence musicianship. 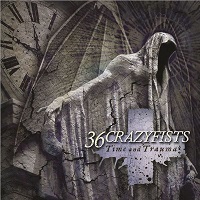 36CRAZYFISTS are back and armed with a phenomenal album Time And Trauma. And I have to say its a very diverse record, 36CRAZYFISTS represents the Metalcore genre amazingly as they are the ones that I believe in my own opinion to have pioneered it. My favorite song on the record would have to be “Gathering Bones”; such a beautifully crafted song. Brock Lindow as a vocalist delivers as always, he has such a virtuoso vocal range when singing especially when blended with Steve Holt's stunning guitar playing. Mick Whitney is one of the most talented bass players in the scene still got it, and has without a doubt on this record given listeners the best bass-tone I have heard from the band's entire career. Now I have to go off topic for a bit to discuss the band as a whole and how far they have come in their career and to start off by saying happy 21st birthday to 36CRAZYFISTS ;you have had a huge impact on my personal life. Your music helped me through some of the darkest times in my teen years, so thank you very much for your great music; here is a beer, for I toast towards many more years of your career! Another favorite of mine on “Time And Trauma” has to be “Marrow”. This is one of the best power-ballads ever recorded in modern music, I have been trying to do some research on who the female singer is because her voice really mashes perfectly with Brock’s voice. I can’t express-to-justice how diverse "Time And Trauma" really is and I will try to explain it best as possible, in terms of influences and how I view this album. With influences such as DEFTONES, METALLICA, IRON MAIDEN, KORN, SLIPKNOT, it is very fair to say 36CRAZYFISTS are very well rounded in terms of sound, because with each record they redefined their sound and I truly believe they haven’t had a bad release yet; the band seems to get better and better with every day that hits them. They may have lost a few band members but they are very persistent and continue to deliver the goods. It may have been five years since 2010 "Collisions And Castaways" and I love how they spent a lot of time putting "Time And Trauma" together because the wait was bloody worth it such a well-balanced record should NEVER go unnoticed! !